The Mitsubishi MXZ4B36NA+MSZGE06NAx3+MSZGE12NA Mr. Slim Wall Mounted Quad Zone Mini Split Heat Pump System - 30000 BTU is the deal solution for multiple applications, including residential, commercial and industrial. This MitsubishiMXZ4B36NA+MSZGE06NAx3+MSZGE12NA Mr. 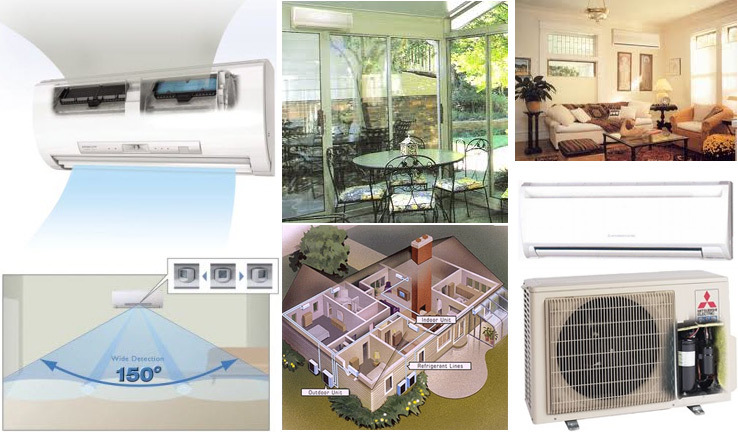 Slim Wall Mounted Quad Zone Mini Split Heat Pump System will provide you with 30000 BTU of heating and cooling capacity. This efficient and effective Mitsubishi Heat Pump System, featuring high reliability and rugged construction, provides an excellent choice where personal comfort and equipment cooling meet. Thanks to Mitsubishi Electric's 30 Years of Experience, proven INVERTER-driven compressors and electronic linear expansion valves, combined with advanced control and sensor technology, provide the right performance to meet critical loads in high reliability applications. This synergy of smart design and cutting-edge environmental technology delivered by the Mitsubishi MXZ4B36NA+MSZGE06NAx3+MSZGE12NA Mr. Slim Wall Mounted Quad Zone Mini Split Heat Pump System results in true eco-comfort for any space. High sensible heat factors averaging over 75% of system-rated capacity can handle heat generated by computers, power supplies, and other electrical and mechanical devices. Full-capacity cooling output down to zero degrees outdoor ambient (with optional wind baffle installed) provides excellent heat transfer in indoor equipment rooms and critical service centers transferring heat gains outside. High on the wall to blend into a room without taking up window space. In the ceiling or below the floor and totally out of sight. Low on the wall at floor level to be unobtrusive within the space. Learn why Mitsubishi Mini-Split Heat Pump Systems are Flexible and Quiet. The MXZ4B36NA+MSZGE06NAx3+MSZGE12NA Mr. Slim Wall Mounted Quad Zone Mini Split Heat Pump System uses Mitsubishi Electric's sophisticated electronic control systems, which detect any changes in room or zone temperature and, like a car's cruise control, automatically adjust the speed of the integrated INVERTER driven compressor in the outdoor unit and the electronic linear expansion valve (LEV) position for precise capacity control. This feature is unlike conventional units, which only start and stop the constant speed compressor repetitively. Special components within the compressor such as high density windings in the motor increase the magnetic flux and artificial magnets in the rotor to reduce its weight, allowing the compressor to operate at higher energy efficiencies with better performance than ever before, while producing low sound levels both during start-up and while running. Inverter Driven Compressor - Maximizes energy savings by making sure only the energy needed to cool or heat an area perfectly is used. You can enjoy high-speed cooling and heating and consitent delivery of comfort year-round. Easy Installation - Installs quickly and easily, having no need for major construction and remodeling. Complete Zone Control - Realizes maximum control and energy efficiency by cooling and heating only those spaces in use. Easy and Convinient Controllers - Mitsubishi Electric offers a comprehensive remote controller that controls temperature, fan speed, and more. Choose from four modes: COOL, HEAT, AUTO, and DRY. The controller also has a 12-hour ON/OFF timer for one-button control of your personal comfort. Advanced Microprocesor Technology - Creates a comfortable environment no matter what conditions are outside with our advanced self-monitoring controls. Quiet Operation - You can hold a board meeting or teach a class in quiet comfort. Easy Maintain - With easily accessible filters, little or no ductwork to keep clean, and simple wiring between the indoor and outdoor units, Mitsubishi Heat Pump Systems require minimal maintenance, providing another level of comfort and convenience. Environmentally Friendly Refrigerant - Uses R410A, an environmentally friendly refrigerant. Mitsubishi MSZGE06NA - Indoor Unit with wireless controller. Mitsubishi MSZGE12NA - Indoor Unit with wireless controller.